What is the best type of gas leak detector? Detectors must be able to be calibrated and to hold that calibration. Detectors must be able to detect down to the target range. Calibrated to one type of gas, detectors must be highly selective with no false measures due to other gases. Response time. 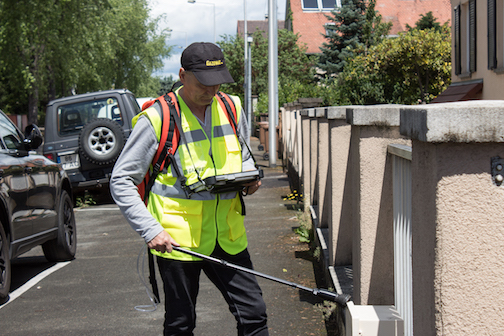 Detectors must respond as quickly as possible in order to provide the most precise leak location and to enable survey speed increase. Depending on the need and budget, there are many options on the market to fit an organization’s need. Semiconductor detectors are at a bargain price but limited in terms of measurement stability, sensitivity, and selectivity. Semi-conductor sensor detectors are made of metal oxide specially designed to react to gas. When the sensor is warmed to a high temperature and gas is present, the sensor surface absorbs oxygen molecules from the air sample, changing the electrical resistance characteristics of the sensor. This change is measured and gives the gas concentration level. These devices are most often used for localization rather than leak survey. Semi-conductor detectors are easy to use, but they are sensitive to many gasses and therefore not selective. They also require frequent calibration. Because sensitivity range is high, they are primarily used for localization. In high concentration, MOS sensor saturates- takes time to return to zero. Explosimeters are another option. Explosimeters use pellistor sensors, which consist of a wire coated with a catalytic substance, platine. Based on its temperature, the electrical resistance of the wire changes. This resistance is measured and gives an image of the gas concentration. For the explosimeter measurement, the wire is heated by a current at 842°F (450°C). Because of the wire’s composition, the gas is oxidized in contact with the target gas. The reaction increases the temperature of the wire, changing its resistance. This combustion through an oxidizing process requires oxygen. The technique allows detection of a concentration ranging from 0 to 100% LEL with a precision of 2 %. If the concentration is higher than 100% LEL, the gas burns inside the measurement chamber and may impair the wire. As a result, these sensors must not be used to detect concentrations above 100% LEL. For higher concentrations, catharometer sensors are most suitable. The sensor is composed of two wires. One is in contact with the target gas and the other with a reference clean gas. This sensor relies on the thermal conductivity differences from one gas to another. For example, methane conducts twice as well as air. So when the sensor is in contact with the target gas, the equilibrium temperature will be broken and its resistance will change. The measurement of resistance will give a concentration ranging from 1% volume gas to 100% volume gas. Combining both sensor types in one unit as in the explosimenter-catharometer detectors (ECDs), prevents damage to the explosimeter sensor. The main advantages are stability, prevision, and insensitivity to humidity. The main drawbacks are that the combination unit is not selective, and that sensitivity is not as high as with other detectors. Explosion-proof explosimeter-catharometer units are used in hazardous environments for on-foot detection and localization. Optical detectors, a more recent choice, is based on a gas molecule’s property of absorbing radiation. The absorption spectrum of a molecule, which is specific to each gas, ensures identification of the molecule that is interacting with the light source which could be an incandescent bulb, a microelectromechanical (MEM) system, a light-emitting diode (LED, or a laser beam. The objective is to match the wavelength of the light source with a relevant portion of the electromagnetic spectrum of the molecule and to measure the strongest variation in the intensity of the transmitted light. One example of optical technology is the open path barrier system which uses an infrared light and an optical filter. In the case of detection by vehicle, the beam of infrared light is spread across the front of the vehicle and an optical filter, placed at one end of the beam, records the intensity. 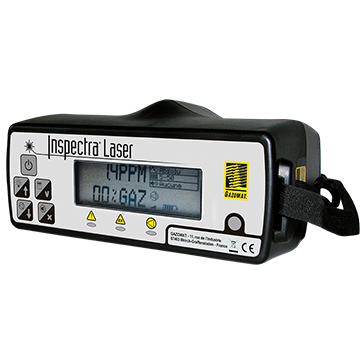 This enables gas detection at the ppm level and eliminates the need for sampling equipment. Dirt, mud deposits cause a sensitivity loss of optics – must be cleaned regularly. Another example is the multipass measurement cell, which uses a laser beam to analyze the gas concentration level within an air sample. This system detects measurements ranging from 0ppm to 100 % volume gas. Choosing a gas leak detector really comes down to finding one that best fits the need. If you are unsure about which type of detector is best for your survey and localization situation, contact us for a free consultation. Leak detection and repair (LDAR) is the process of surveying, identifying, and repairing natural gas leaks. This process is put into practice at a variety of facilities such as chemical, refineries, and oil and gas operations. Regulations vary from state to state within the US. Therefore, each LDAR program must adapt its process accordingly. The US Environmental Protection Agency has established five basic elements of an LDAR program: identifying components, leak definition, monitoring components, repairing components, recordkeeping. An LDAR program is good for all; the natural gas enterprises, the employees at these facilities, and the community. Now, what is Smart LDAR? A well known study by the American Petroleum Institute found that over 90% of leaks (which are most often random) come from around 0.13% of the components. Smart LDAR is an alternative work practice, which uses optical technology to seek out those 0.13% of components. The goal of Smart LDAR is to focus on identifying and repairing larger leaks more efficiently with optical technology such as infrared and laser.